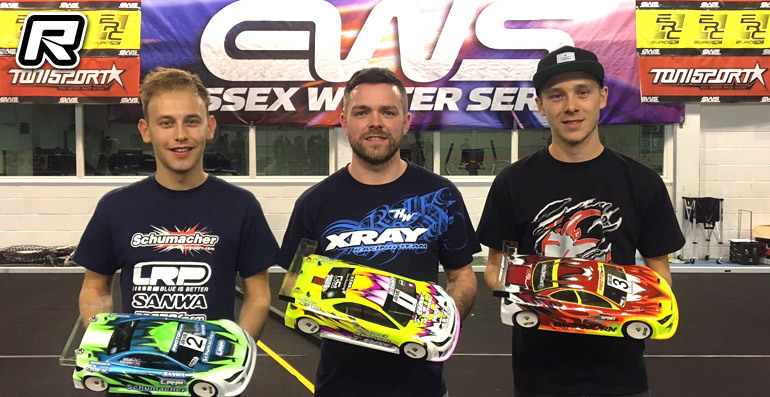 The 2017-2018 Essex Winter Series Presented By Infinity got underway this weekend. Once again, a full capacity entry provided a busy and competitive day of racing, as a an all-new track layout greeted the drivers to kick off one of the largest on-road series in Europe. Olly Jefferies, the winner of last year’s season-closing EWS International got off to the best start, topping the opening round of qualifying ahead of defending series champion Elliott Harper. Kyle Branson, the only driver to have beaten Olly in the UK so far in 2017, also remained in contention and took third in the round ahead of Chris Grainger. The top three were covered by just 7-tenths of a second after five minutes, highlighting how close the competition could be this season. Despite the close attentions of his challengers, Olly managed to complete a clean sweep of qualifying with his Xray, taking all four of the rounds. Elliott kept him honest, his Schumacher frequently leading the heats at points each round, but at the end of the run it was Olly who always came out on top. Kyle also continued to impress, each time remaining in touch with the leading duo, and securing third overall for Capricorn. Chris’s Associated showed a new turn of speed and set the fastest lap of qualifying, but he wasn’t able to quite keep the pace up for the whole run each time, finishing a couple of seconds back on Olly each time. A third place in Q2 was enough to give him fourth overall on the A Final grid and a strong chance to challenge for the podium. The single-leg A Final saw Olly lead the pack off, with the top four running in grid order. Elliott remained in touch with Olly through the early stages, but the 2017 BRCA champion made no mistakes and stayed out in front for the first half of the race. The action on track for the first three minutes was between Kyle and Chris, the two cars running virtually nose to tail and providing plenty of excitement for the spectators. But despite everything he tried, Chris couldn’t quite put himself in a position to make a move that would net him a podium finish at the end. As the race moved into the closing stages, Elliott found a new turn of speed and closed the gap on Olly at the front. Elliott began lining up a pass and kept his Schumacher tucked under the rear wing of the Xray in front of him. One opportunity presented itself to Elliott as the cars went into the fast front section of the track. But Olly kept his lines tight, forcing Elliott onto the kerbing and with a slight loss of grip, Elliott had a half-spin and thus lost any chance of completing the pass to take the win. Behind the top four, a good run for Harley Eldridge from eighth on the grid saw her fighting with Matt White, with the youngster, now no longer classed as a Junior, securing fifth at the finish line. In the Super Stock class, a number of new faces to the series throughout the field hoped to shake things up a bit – but defending champion Zak Finlay hadn’t read the script as he stamped his authority and took the opening round by just over three seconds. 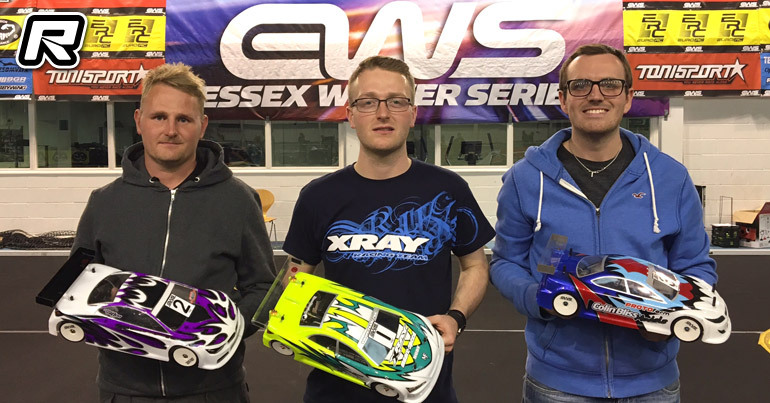 Last year’s perennial runner up, Tony Broad, found himself again in that position in the opening rounds, taking second behind Zak in Q1 and Q2, with Ashley Wiffen then securing second in the last two qualifiers. Crucially, Ashley’s best time was two-seconds quicker than Tony, leaving him to line up second on the grid with Tony third. Marcus Askell had consistent opening rounds to secure fourth overall, with Ricky Copsey showing a lot of single-lap speed, but unable to keep his car consistent for the whole run and thus lining up fifth. The A Final demonstrated just why Zak is the current EWS and BRCA Super Stock champion, building an early lead of between two and three seconds as Ashley and Tony, as expected from qualifying, fought to be ‘best of the rest’. With both of the drivers veterans of the EWS championship, both having taken many podium results, they knew how to race each other and despite Tony’s best efforts, Ashley kept his car glued to the track and provided no opportunities for Tony to make a successful pass. 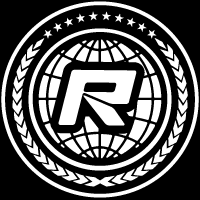 Colin Jackson and Chris Clarke moved up from their qualifying positions and engaged in a battle with Marcus Askell, the three drivers eventually crossing the finish line separated by just one and a half tenths of a second. But none of the action behind troubled Zak at all, as he cruised to the victory to get his EWS championship defence off to the best possible start.